Welcome! If you’re reading this transmission, you’ve come with an interest in the writings of Sean M. Peters and/or the artwork of John Sebastian. Quantum Titan: Forerunner tells the story of Declan Kade, a teenager who’s built his own jet from parts out of a scrapyard. With the flying craft he calls Forerunner, Declan enters a whole new altitude of adventure as he embarks on a journey to prove his skills as a pilot and engineer at New Horizons Technical Institute, the most advanced flight academy on the planet. Start from the beginning and read Quantum Titan: Forerunner, the first book in this exciting new science-fiction tale. “Do not attempt to divert from your current course,” the radio buzzed. The Servicers’ magnetic harpoons seized Forerunner, she shuddered, and was still. Declan’s controls were useless. “What do you think you’re doing?” Declan yelled in disbelief. “You are being escorted to New Horizons Security Port for questioning.” The voice was curt and unimpressed. “Listen to me, this is a mistake.” His controls were still unresponsive. “You have illegally entered New Horizons airspace in an unregistered craft.” The Servicers were now towing him like a stubborn dog on a leash. Declan had no choice but to call home. The signal was received at once. “Regan Kade speaking.” His father’s voice was mechanical. He was likely expecting the call to concern harbor business. “Towed in what?” Regan’s voice was suspicious despite his obvious concern. “Your mother should be on her way home by now. Are you going to tell me what’s going on?” What if New Horizons Tech won’t let me enroll because of this? thought Declan as he watched the Servicers ahead drag his craft through thick clouds. Like wiping away a steamy window, the plumes suddenly cleared, showing from a great distance the monolithic security port erected from the ocean in a mass of orange and blue signal beacons. The waves below absorbed the unnatural lights like an infection. “Deck? You’d better not have to explain from a jail cell,” said his father. As he tried to respond, sparks erupted from Declan’s communication console and the cockpit filled with black smoke and the smell of burning plastic. He and Forerunner were not enjoying the maiden voyage. He activated the ventilators and hoped they would not also catch fire, but the fans cleared the cabin. Having had control over his aircraft for less than an hour, he was left with nothing to do but wait for several minutes until it was impounded by the same company that operated his intended university. This did not seem, to Declan, a great first impression. A dozen armed guards surrounded Forerunner as soon as she was released from the magnetic harpoons. One of the pilots that had towed Forerunner exited his Servicer with a pistol trained at Declan. “Hands off the controls and lock your fingers behind your head. 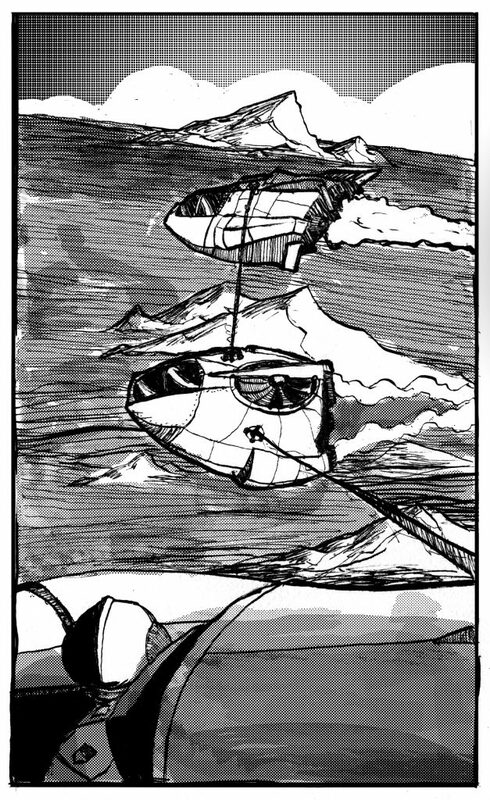 Do not make any other moves,” yelled the Servicer pilot, his orders slightly muffled by a mirrored flight helmet, the same kind Declan thought he’d soon wear. “Comply!” yelled the pilot, firing his pistol into the concrete near Forerunner’s cockpit. 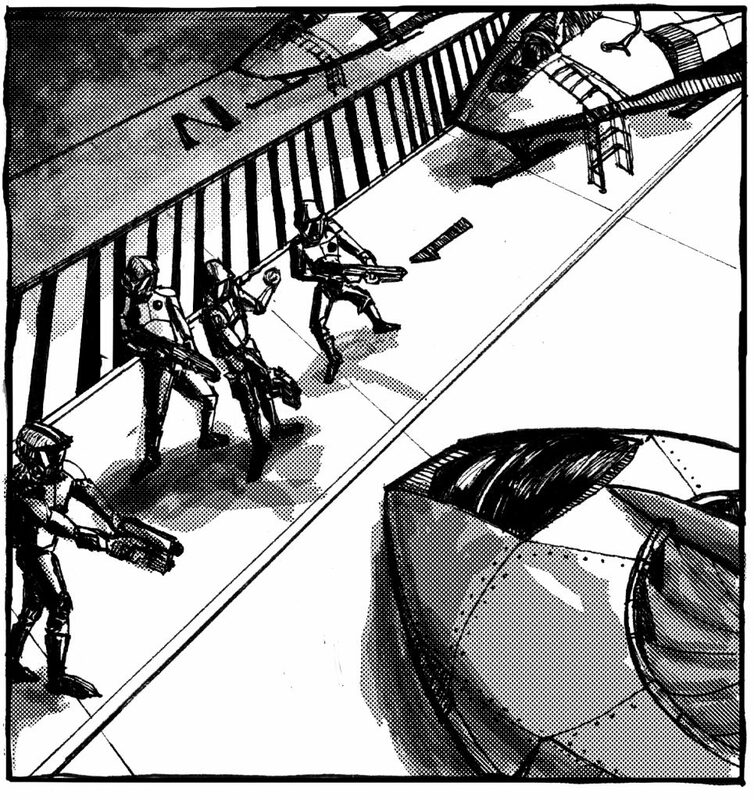 The shot’s report startled the surrounding guards, who tightened their ranks around Forerunner. He’s going to shoot me unless I get out of here right now, thought Declan, who gripped the controls even tighter. His escape would require breaking the circle of guards. “Cadet, stand down,” bellowed a guard who approached the pistol-wielding pilot. Want to read more? You can buy the first book in this new series here. Posted on February 2, 2017 February 17, 2017 Tags 70s, art, doom, quantum, scifi, space, time, titan, travel, trippyLeave a comment on Greetings, Travellers!